Over the years, our HVAC contractors have realized that many homeowners tend to forget about their systems. But then something happens. You go to switch on the air conditioning or heating and realize the system just isn’t functioning the way it normally does. Naturally, your next step is to research the problem. 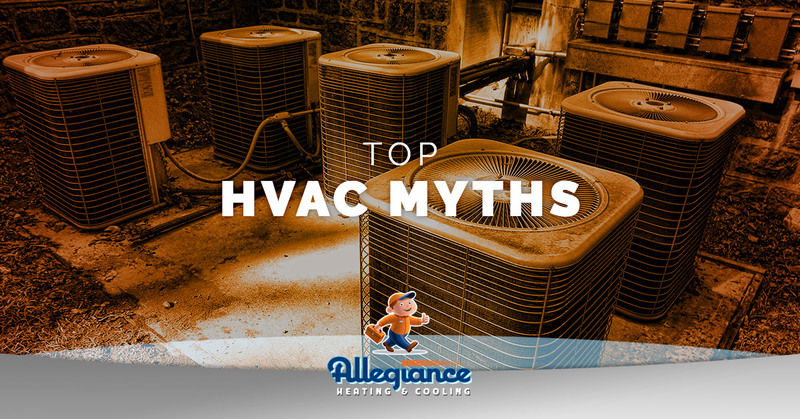 Unfortunately, there are countless misconceptions out there when it comes to HVAC systems. Keep reading as we debunk some of the more common ones, as referenced from Angie’s List. There’s no need to clean the outdoor unit – The job of the outdoor unit and condenser fan is to move air through the coils. When mud, grass, dirt, and other debris accumulate inside, the system is forced to work harder. Not surprisingly, all of this gunk decreases system efficiency and spikes those energy bills. That’s why occasionally cleaning your unit is so important. A quick hose-down should do the trick. I can put off checking my air filters – ‘Replace air filter.’ It’s right there at the top of your honey-do list. But you put it off for weeks and weeks as you dread that trip to the home improvement store. Here’s the thing, though: an HVAC filter serves as the main line of defense against contaminants. The more contaminants that wind up clogging up the works, the harder your system has to perform. Our HVAC repair team recommends changing your filter once a month. It’s best to leave the thermostat fan on “auto” – This is only partly true. During the winter, not turning on the thermostat until you get home makes sense. But it’s a different story when the outside temperature increases. Believe it or not, constantly running your HVAC fan actually saves energy and improves comfort down the road. I should set my thermostat to a higher temperature when I’m not home – This myth piggybacks off the aforementioned one. Let’s say that you come home from work and it’s 80 degrees in the house (yikes). Your system will have to kick things into overdrive before it can start cooling the house and removing humidity. As an alternative, find a temperature your family is comfortable with and don’t mess with the thermostat any longer. I don’t need to contact a professional HVAC company – Homeowners love taking on DIY projects because it saves them money. But when it comes to heating and A/C dilemmas, it’s best to contact your local HVAC contractors. Sure, it may be tempting to purchase a cheap part and install it yourself. But should you connect the wrong wire, for example, you could be looking at an emergency. At Allegiance Heating & Cooling, our mission is to exceed your expectations. You can count on us to arrive promptly, respect you and your property, and do the highest quality of work. Family owned and operated, we guarantee our work for the number of years you own your home. Don’t get bogged down in HVAC misconceptions. Put your heating repair and air conditioning repair needs in the hands of Allegiance. We offer boiler service, generator repair, fireplace repair, and much more.